The variety I tried was called "Ham, Egg & Cheese On Pancakes". I won't recommend this product for anyone on a diet because of the 3.5 grams of saturated fat, 10 grams of sugar and 33 grams of carbs per sandwich. However, if you've eaten healthy all week and you deserve a treat that's not all that good for you, you really might like these sandwiches. I was genuinely surprised how much I liked them. I don't like McDonalds' McGriddle sandwiches and I was expecting to be trying a microwavable copy of that sandwich. My complaint about the McGriddle is that the maple flavor in the "pancakes" tastes mildly synthetic. This new sandwich succeeds where McDonalds failed. The pancakes that hold the sandwich together taste great. It doesn't taste like pure maple syrup, but more like it's infused with Aunt Jemima pancake syrup - which is probably to be expected. At any rate, it works. Certainly, you still have to contend with the microwaved egg. There's been advancements in recent years, but microwaved eggs in any form can't compare to those cooked fresh. That said, the egg here is better than that found in many similar products. Recent Jimmy Dean breakfast sandwiches served up chewy egg patties. Fortunately, that's not the case here. All in all, I enjoyed this one. One word of warning: Don't exceed the one minute and 20 second suggested microwave time without checking the sandwich first. I put one in microwave for 1 minute and 40 seconds and it was cheesy mess... cheese everywhere... in the package... coating the pancakes.... dripping out of the bag... just a mess. At the suggested time, it turned out fine. 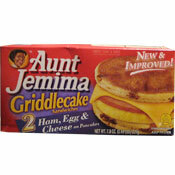 What do you think of Aunt Jemima Griddlecake Sandwiches? I would like to know where I can buy them in Oklahoma. 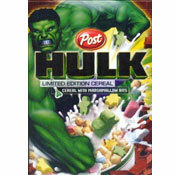 My stores have stopped selling them. My son loves this Aunt Jemima sandwich and I had a chance to taste one. I like that the syrup is in the pancake that makes it sweet. The egg, cheese, and sausage are a great combination with the pancake. I find this item hard to find at some grocery stores and when I do find it, the store doesn't keep enough of on the shelf. My kids love them. They're awesome. One box lasts only 2 days in my house. These taste like McDonalds McGriddles but with ham, egg, and cheese.